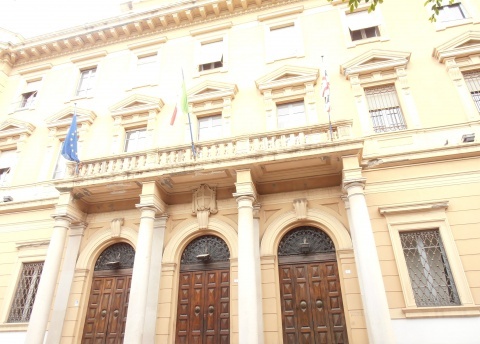 The palace of Postal and Telegraph services, built between 1926 and 1932, is situated at Piazza del Carmine in a area between via Maddalena and vico Sassari. The building stands on several levels including the mezzanine floor, where the offices open to the public are located, and the two upper floors for administrative offices. The building is characterized by a central body delimited by two prominent side wings, also visible in the pillars that vertically outline the entire building. In the side wings the aligned windows are completely different on each floor, while in the central body, an atrium(consisting of three large arched openings that allow the access to the building) supported by four Doric columns dominates the entrance's staircase. The building is completed by a protruding cornice with a parapet and the central top aligned with the atrium.